According to Google Reader, I subscribe to over 200 food blogs and have read 2,608 posts in the past 30 days. Considering these staggering numbers, it should come as no surprise that the information I glean online greatly influences my dining choices at home and out on the town. Whether it’s a professional site or an amateur effort, there’s something about the combination of mouthwatering photos and excitable words that sends my cravings through the roof. 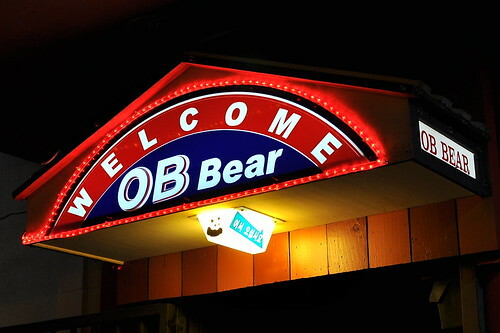 The latest case of the blog-inspired hunger pangs occurred after reading The Roaming Belly’s write up on OB Bear. Amy’s potent words and photos left me with an intense hankering for Korean pub grub that needed to be satisfied as soon as possible. After exchanging a few of emails, Amy agreed to accompany me for another greasy, spicy go-round the following week. My gochujang-covered dreams were realized on a random Wednesday evening. We were joined by The Astronomer, Danny, Hong, Remil, and Amy’s fiance Dennis—we took advantage of our large group to order quite a bit of food. And just in case you’re curious, the restaurant is named after a Seoul-based professional baseball team that was at one time sponsored by Oriental Brewery (OB). Our party of seven was seated straightaway and shared a comfy booth in the “non-smoking” section of the restaurant. 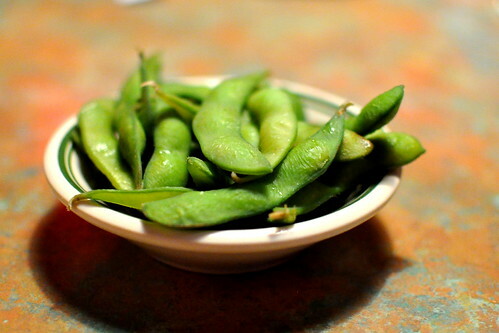 As soon as our bottoms hit the cushions, a small dish of shriveled edamame arrived for us to nibble on. The skins may have been compromised, but the beans inside were perfectly fine. 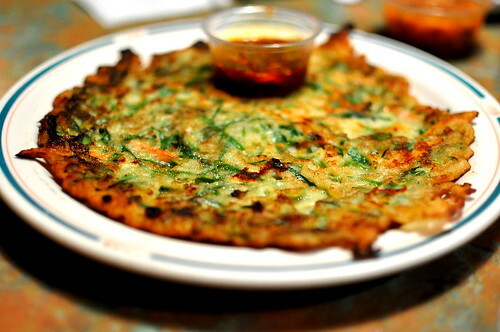 We also received a complimentary savory pancake served with a slightly spicy soy dipping sauce. I made sure to get my one-seventh of the oily, golden, and satisfying pancake. 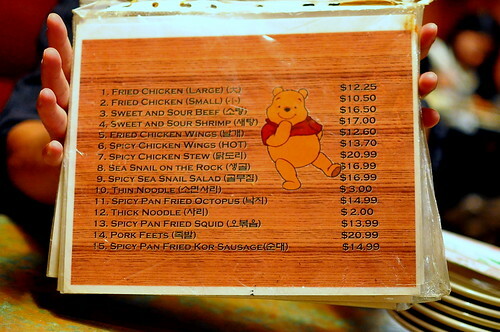 The first official course to arrive were “pork feets” ($20.99). The trotters were served on a tremendous platter, thinly sliced and a touch chilled. Extracted from about half a dozen “feets,” each slice had a bit of chewy skin, a thin strip of fat, and of course, pink meat—a trifecta of deliciousness. 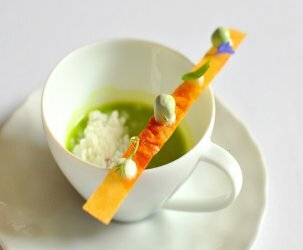 Served alongside the feets was a simply dressed scallion salad and a dipping sauce made from salted shrimp. 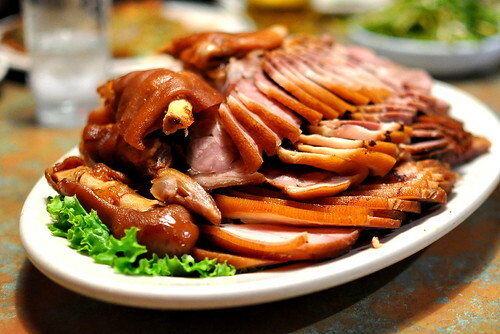 This dish is a must-order for swine lovers. One of the highlights of the meal was the “spicy chicken wings” ($13.70). Twice-fried and lacquered in a sweet chili sauce, the wings brought a sensational and addictive burn. Pickled daikon cubes and a Thousand Island-dressed cabbage slaw were on hand to quell the pain. 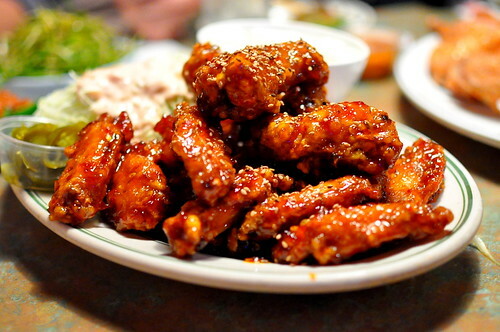 I’ve sampled the wings at a few popular K-town pubs including Hite and Dwit Gol Mok, and these have got to be my current favorite. 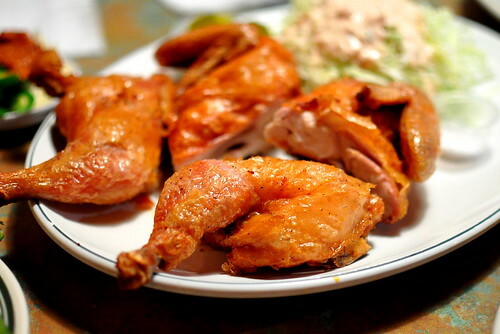 We also ordered a fried Cornish hen ($10.50) to balance out the wings’ onslaught of spice. The paper-thin skins were extraordinarily crisp, while the flesh was juicy and tender. 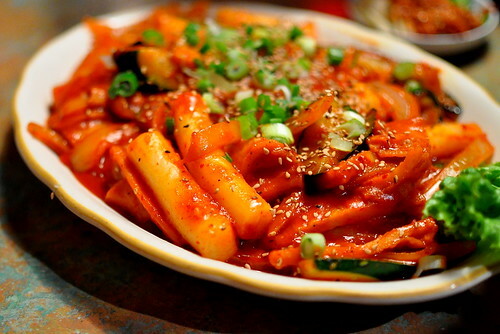 A pub grub feast would not be complete without a plate of dukboki—Korean rice cakes with zucchini, onions, and fried fish cakes in a wildly spicy sauce. I am a dukboki-aholic, and this humongous serving brought me immense joy—chewy rice cylinder joy! Hitting a similarly awesome note was the spicy pan fried squid ($13.99) served with thin noodles ($3). 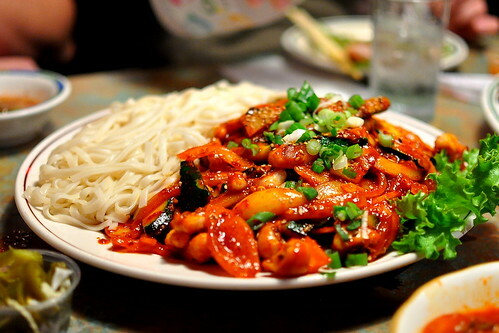 This was my first time tasting this dish, but the flavors were totally familiar due to the dousing of red pepper paste. I especially liked the addition of oval-shaped rice cakes in the squid mix. 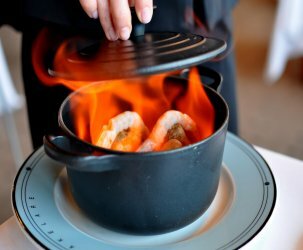 The only dish that bombed this evening was the seafood pancake. We were hoping for something similar to the complimentary one, but instead we received a version made with layers of leeks, eggs, and batter. The pancake was thick, clumsy, and mostly left untouched. Verdict: OMG, I love it! 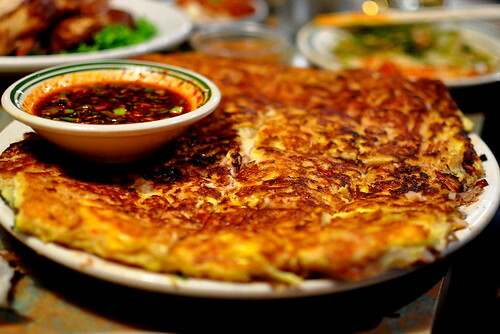 You just passed along a tremendous hankering for Korean food…especially with those pancakes and squid dishes! Amy’s belly is a good one to roam with. 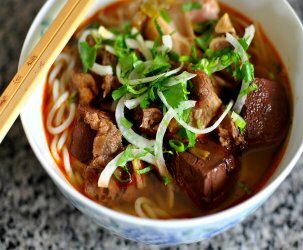 Yay for dukboki! Down with cubed chicken. the verdict for your post: omg, i love it! 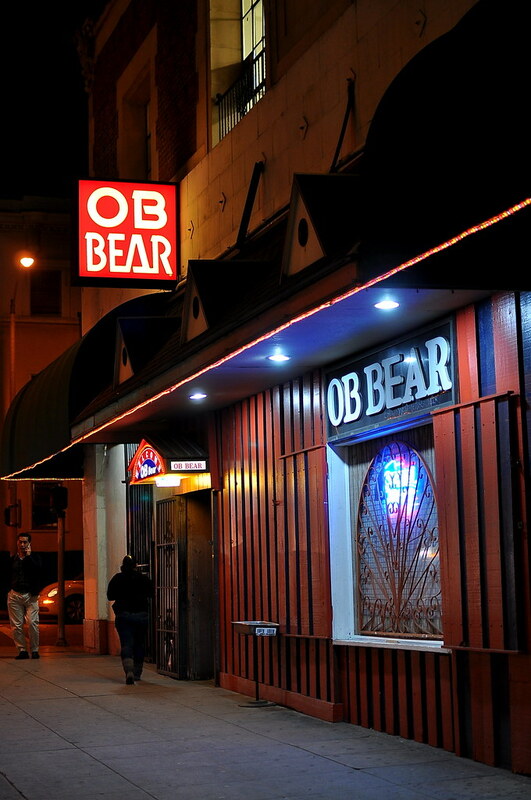 you don’t have to twist my arm to get me back to ob bear. that chicken is FABulous. i am going to dream about spicy chicken wings tonight. You had me at feets. 🙂 Looks awesome! And love the RB style verdict!